In the article, Benjamin Morris tries to analyze how “bad”* the Detroit Pistons of the late 1980s and early 1990s (Bill Laimbeer, Rick Mahorn, Dennis Rodman, etc.) were, with full 538 gusto: “That seems like just the kind of thing a data-driven operation might want to quantify.” But the attempt falls short in some telling ways. First, Morris has to find a quantitative proxy for “badness.” He selects technical fouls. Huh? That’s really weak. Any basketball fan old enough will tell you that the Pistons were known for physical play, for pushing and shoving under the basket and fouling rather than giving up layups, but none of this has anything to do with technical fouls. At the end of the day, Morris uses technical fouls because he doesn’t have anything else to use. This is called looking for your keys under the lamppost, and it’s generally considered a bad empirical method. Morris then makes his argument even more tortured by saying that unsportsmanlike conduct alone does not constitute “badness”—it has to be unsportsmanlike conduct in the pursuit of winning: “For a team to earn a nickname prominently declaring how ‘bad’ it is, the players should be using their badness to make them better.” Now, it is true that the Pistons combined a high technical foul rate with a high winning percentage. But I’m mystified at what the point is here. We already knew that the Pistons were a very, very good team—we wouldn’t be talking about them otherwise. So I’m not sure how it adds anything to the analysis at this point. Anyway, let’s stipulate for the point of argument that unsportsmanlike conduct constitutes “badness.” Morris makes the rather dodgy assumption that technical fouls accurately measure unsportsmanlike conduct. But there are other reasons why the Pistons might have gotten a lot of technical fouls. For one, once they acquired a reputation for being “bad,” referees almost certainly looked at them differently. Players’ reputations affect the calls that referees make against them; Larry Bird could complain about a call without getting a technical, while Dennis Rodman would get one for far less. In other words, technical fouls are partially measuring perceptions of badness. This means they are pretty unreliable as a vehicle for measuring the actual badness of a team that had a reputation for it. This is pretty basic stuff when it comes to statistics. You have to think about whether a variable is an accurate measure of some underlying characteristic. But when technical fouls are all you have to deal with, you end up ignoring this kind of issue. The observations are individual team-years. The Y axis is the team’s technical fouls divided by the league average for that year. What’s the X axis? 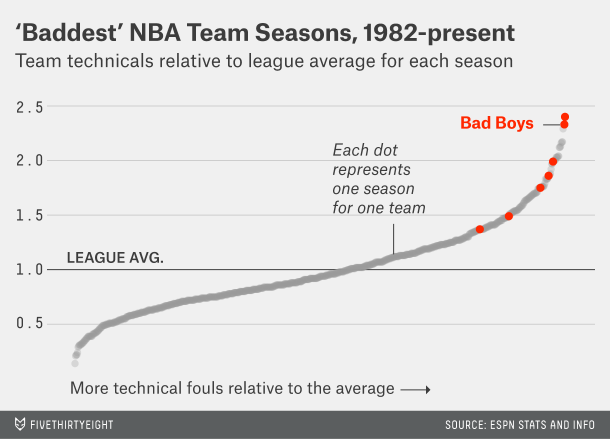 It says “More technical fouls relative to the average,” but that could just as well be the label for the Y axis. I’m pretty sure that all the team-years are just arranged sequentially from left to right, from fewest relative technicals to most relative technicals. Which is a pretty unhelpful way to display this information. If you only have one dimension (number of technicals), you don’t need a chart: just say the Pistons had 7 out of the top X seasons, including the top 2, and save the ink. If you want to show the extent to which the Pistons were outliers, use a frequency distribution so we can see the mode around 1 and the Pistons out in the tail. Don’t use two dimensions to tell a one-dimensional story. Donald Rumsfeld famously said, “You go to war with the army you have.” Well, this is what happens when you try to answer a vague and complicated question but you only have one data series—and not a particularly appropriate one. Morris triumphantly concludes, “For once, a harder look at the data seemingly confirms rather than undermines a popular sports narrative.” I think XKCD (see the previous link) still has the last word. * “Not bad meaning bad but bad meaning good,” that is. This entry was posted in Commentary and tagged sports, statistics. Bookmark the permalink. How bad were the Pistons? Badder than that article. You run a story with the journalists you have, not the journalists you might want or wish to have at a later time. Who’s bad for the environment? I am also a fan of basketball and what we can see all the action and be accepted. I just watched the 30 for 30 on the Pistons and it was a great two hours of entertainment. Called the “bad boys”—although not really sure why. Physical play was permitted in the early Stern era. Of course, the film emphasized the most physical play but physical play was on all teams. I had not realized how good the team was for 4 years. Lambier was a tough dude, and maybe a bit more than other centers. Jordon, who had yet to win anything, called them dirty and bad for basketball. Cannot imagine Larry Bird saying that then. I was amazed at how likeable and almost naive the young Rodman was. Of course the killer was the comment by both Thomas and Rodman on Bird. Just after he crushed them with a 38/9/8 performance to eliminate them from the tournament in ECFinals, Rodman and Isiah tag teamed on “if he was black he would be just another good guy”. It was just so idiotic. But it was Thomas who could not really admit the absurdity of it—perhaps because he believed it. They made Bird and Thomas sit on a podium with the press before the Laker Celtics finals. Bird just said, “if it doesn’t bother me why should it bother you?”. Then left to prepare for game in a few hours. But Thomas just could not let it go—-never really saying it was stupid (look at life time stats both traditional and statistical measures to see how stupid the comment was)—-. Why Rumdfeldian? Why not “Benghazian”? Rumsfeld didn’t make many friends when it was all said and done, and the bombast didn’t work either. It’s not in the news now days thanks to things like Syria, but Iraq is a huge mess and is actually slowly falling into three nations.